I've been busy working to meet a few deadlines, but took a break to create this card using the News Print Reveal Technique from the April TJNL. I hadn't tried the technique when I was working on assignments for the April Issue, but have seen some lovely cards made using it, so I thought I'd give it a try. I'm happy with the end results, and will be creating a few more, while I still have some News Print in the house. 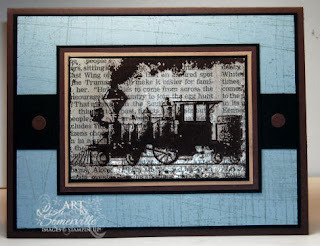 This is one cool technique and I just love that train image. Wow! Its very eye catching. Wow! This is super cool and I love the image you picked to pair it with...looks fantastic! I love this card...perfect for that masculine card! Very cool card, Lisa! I love the newspaper idea...I will have to try that! Love this, Lisa!! This technique is really neat...I will have to give it a try! !